I’m a classic late adopter: DVD, cellphone, smartphone, Chinese baby. So maybe 15 years for me to finally sign up for E-Z Pass is not so bad. I was curious when the system was launched in New Jersey in 1997, but I was skeptical. In the summer of 1999, my forward-thinking friend Maia was imploring me to sign up for E-Z Pass. I don’t know, maybe I just expected more transportation-wise by 1999. And I just never felt like I drove enough to warrant it. My 1991 Corolla is about to crack 89,000 miles. Sure, there have been regrets over the years. I’ve sat in many a lengthy cash/receipts lane while the E-Z Pass folks flew by. But generally it wasn’t much of a hassle not having it. In the past couple of years, though, the Port Authority and their Turnpike and Parkway cronies have been trying to smoke me out. Went through a mystery E-Z Pass checkpoint on the Garden State Parkway without even knowing it. (Successfully battled the fine I received in the mail, claiming ignorance. My ignorance is well-known throughout the state.) On trips via lesser Parkway exits in central Jersey, I’d find that the cash toll booths were no longer manned. You needed exact change. Who has exact change? If you didn’t have exact change, you were supposed to take an envelope and mail in your toll later. Except, they weren’t refilling the quaint old envelope holders. I didn’t want to dodge the toll, but they weren’t helping me. Then this year, things got really out of control. Turnpike fares increased 53%. My most common trip, exit 14C to exit 9, jumped from $4.35 to $6.65. Just a coincidence that it’s now a penny shy of the “Devil’s Toll”? And then came April 7, 2012—my E-Z Pass tipping point. I had learned that longtime favorite musician Calvin Johnson would be performing in Staten Island. Calvin is based in Olympia, Washington, so a New York appearance is fairly rare. But Staten Island? I’d gone with my family in my teen years, but that was about it. The closest I’d come to returning was a romantic trip on the Staten Island Ferry with a girlfriend many years ago. So, how to do this? PATH train, then subway, then ferry? 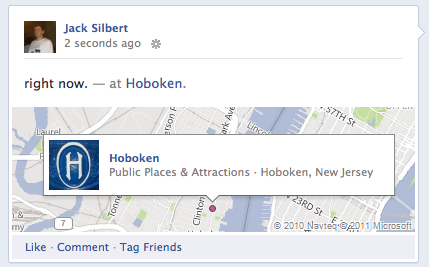 And it was the weekend, so the Hoboken-to-World Trade Center line wouldn’t be running…. Hmmm, kind of a hassle. Then it hit me: Maybe I could drive. I Google-mapped the excursion and liked what I saw. Only 33 minutes! And the “back-door” route appealed to me: Jersey City to Bayonne, over the bridge, and into Staten Island. The concert was at a cool little bookstore/café so I wouldn’t be drinking. On the ride back I could listen to Dan Romanello’s Group Harmony Review. It was settled; I would drive! And I loved the drive. Roads I didn’t know through sparse industrial wasteland in the late-day sun. And then the Bayonne Bridge, which felt like my own secret bridge. There was a lonely little toll booth on the other side. “Twelve dollars,” the collector said. That was it; my long holdout was over. I’d be enrolling in E-Z Pass. If there was any sort of discount available, I wanted it. (As a new freelancer, I’ve been paying a little more attention to my finances, while still hoping to marry money.) Of course, I didn’t research it very throroughly, so am not real sure about any fees ($1 a month, maybe?). And now it seems I may not be saving money a lot of the time, either. Eh, I don’t care. What’s done is done. I needed an excuse to Windex the inside of my windshield, anyway. (The saliva I use to enhance my GPS suction-cup tends to leave an unpleasant residue.) This past Saturday, I peeled the tape strips off the back of the E-Z Pass unit and, as per directions, stuck it an inch to the right of the rearview mirror support, and an a inch below the top of the windshield. Then I drove to Long Island to visit a friend. Holland Tunnel, Queens Midtown Tunnel. Traffic wasn’t bad—mid-holiday weekend—so I didn’t really save any time. Later, I checked my account online. (If you opt-out of receiving a statement, you avoid another fee.) The Queens Midtown Tunnel—for which you pay in both directions, because New York is a hateful, terrible state—was $6.50, same as cash. Holland Tunnel was $9.50 instead of $12. So that’s something. Yet, pulling through that E-Z Pass lane for the first time on Saturday, I did experience some unexpected sadness. I suddenly realized I’d miss the toll takers. “Have a good weekend,” I might’ve said, or “Happy holidays” late at night on December 24. After a long, lonely drive, it was nice to pause and see a human face, have that bit of contact, if only for a few seconds. And now that’s gone too. LOVE this, especially the first line and penultimate paragraph. Love this too. How do you make EZ-Pass poetic? I wanted to compliment you on the first line too! And several others: ‘My ignorance is well-known,’ Devil’s toll, and they should pay us to go to either of those places. Those are my favorites. Anyway, took your gf on a romantic cruise on the Staten Island ferry? Boy are you cheap! Or we could say…thrifty.